Charles Soule addresses Kingpin’s campaign for Mayor of New York City! Talk about your eye-opening moments: Wilson Fisk—the infamous Kingpin—wins the office of Mayor of New York City and Daredevil’s powerless from stopping his old enemy from running roughshod over the town he loves…right? We checked in with writer Charles Soule to see if good things truly can happen to bad people in DAREDEVIL #595—coming November 8—or if Mayor Fisk has to be blind not to see what problems the Man Without Fear can cause him. Marvel.com: So, Charles, can you fight City Hall in the Marvel Universe? 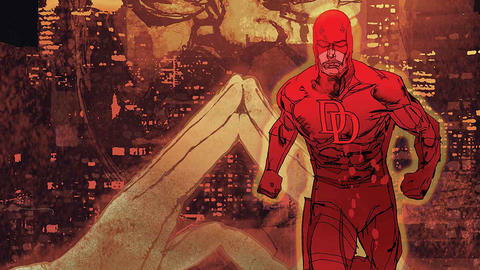 Charles Soule: If anyone might have a chance, it’s Daredevil, aka New York District Attorney Matt Murdock. After all, he’s armed with more than just his incredible fighting skills and enhanced senses—he has what might be the strongest power of all: a thorough understanding of the legal system. That’s not to say it’ll be easy, of course—the Mayor’s office is incredibly powerful in New York City, with city agencies at its beck and call—including, of course, the NYPD. Should be a hell of a fight. Marvel.com: To say the least! But where’s Matt’s head at as he goes into this storyline? What’s he dealing with that might complicate his approach to the Fisk administration? Charles Soule: Matt feels, to a degree, like his city has gone insane. Either that, or much more likely, Kingpin pulled one of his trademark shenanigans and rigged the system somehow. In either case, the place he’s sworn to protect has turned against him in some ways, and he’s having a hard time understanding or dealing with it. Plus, of course, Wilson Fisk knows that the costumed heroes are a huge threat to his plans, and he’ll take immediate steps to shut them down. Should be amazing. Beyond that, we’ll have the return of a new character I introduced back in DAREDEVIL#11, Muse, the serial killer artist who made Murdock’s life—and that of his apprentice Sam Chung, aka the young hero Blindspot—extremely complicated a little while back. Muse alone is almost impossible to handle, and when you add the Kingpin on top of it…it’ll be something. Marvel.com: What exactly is Fisk’s single greatest qualification for being mayor of a major metropolitan city? Charles Soule: As he tells the city in his campaign: he loves New York as much as anyone can, and he has a clear vision for improving it. Now, the question is whether the Kingpin’s city is the city New Yorkers would want. We know it’s definitely not what Daredevil wants. Marvel.com: So, you’re sort of saying if he weren’t a criminal, Fisk might in reality become a good mayor? Charles Soule: That’s something we’ll definitely be exploring. Just because The Kingpin is a crime lord doesn’t mean he doesn’t know how to run a city. In fact, it might be exactly the opposite. It’ll be fun to explore. Marvel.com: What are Matt’s greatest risks in opposing Fisk right now? Does he care what anyone in the city actually thinks of him? Charles Soule: The biggest issue, really, is that to fight Fisk, Daredevil will have to fight the city itself, a place he loves and thought he understood. Not anymore. It’s very complicated for him morally and logistically, and he’ll have to figure out how he fits into this new puzzle. Things he took for granted, like the cops turning a blind eye—heh—to his activities, might not be so easily assumed anymore. Marvel.com: What will New York’s criminal element do with this new status quo, in general? Charles Soule: I’d say they’re pretty excited. One of their own has ascended to the big chair, you know? New York City’s their playground. Marvel.com: Lastly, how its feel for you to go back to the original numbering with this issue? Charles Soule: It’s always felt amazing to be part of the incredible Daredevil legacy, and returning to the original numbering with DAREDEVIL #595 cements that for me even more. Not only that, but I get to write DAREDEVIL #600! That will be an incredible issue; the culmination of the “Mayor Fisk story, with twists and turns I’ve been building to forever. I’m very excited for everyone to see where this is all going. Hop on the campaign trail with Charles Soule and artist Stefano Landini with DAREDEVIL #595, arriving November 8!